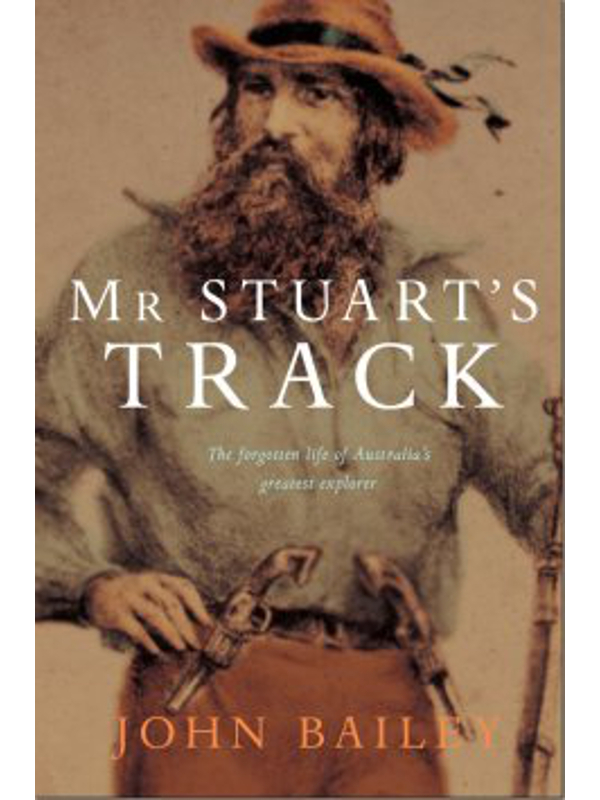 Mr Stuart’s Track follows the extraordinary life of John McDouall Stuart, who was the first explorer to cross the continent of Australia from south to north. On 14 May 1858, an expedition of discovery led by Stuart departed from a copper mine located on the very edge of the known world in the North Flinders Ranges. The Australian continent stretched for another 2,000 kilometres to the north and 2,500 to the west and no white man had the slightest idea of what was there. Stuart was 42, and bush-hardened as tarred rope. He set out with two others, a doughty stockman and an Aboriginal companion. Stuart led six expeditions into the arid centre, his ultimate goal being to cross the desert and arrive at the sea in Northern Australia. Stuart travelled light - just a few men on horseback carrying flour, sugar, tea, tobacco, dried meat, a few spare horseshoes and a single change of clothing. Mr Stuart’s Track is a fascinating study of a loner, an explorer of no fixed abode, who battled alcoholism and ill health to push himself to the limits of endurance to achieve his aim. Film rights to the book have been sold. The book won the Westfield/Waverly Library Award for literature. Additionally, a tribute in song and verse to Stuart's horse, Polly in the Outback, devised and directed by Stuart Partis has been performed by the Kingston Chorus. In this superbly researched and elegantly written narrative … Bailey has tellingly re-created the brilliant journeys and tragic life of Australia’s least understood European explorer. Bailey reveals admirable skill in his depiction of this Scotsman’s complex, somewhat unattractive personality. … Bailey has pulled off an unusual feat in his book. He traverses the ideological minefield of contemporary attitudes towards the 19th century imperial dreams with aplomb, without rancour or special pleading, but with a true historian’s judiciousness and balance. An engrossing and enlightening saga of personal triumph and failure, showing how, in seven expeditions between 1846 and 1862, one man helped map the impenetrable centre of the continent, ending once and for all the notion of a mythical inland sea. Bailey has written a rollicking good tale… From scant resources and Stuart’s own bone-dry journal, full of dates and locations and with scarcely a mention of suffering and despondency, Bailey has built a rich portrait of a man driven by the power of discovery and ultimately destroyed by his own ambitions and demons. John Bailey shows it is still possible to celebrate the full romance of 19th-century exploration. Bailey is also a writer with considerable narrative skills – his book is fascinating and accessible. Recreated conversations based on Bailey’s research are particularly illuminating for the characters and the challenges they create. While the book covers a range of interesting historical subjects and entertaining anecdotes, Mr Stuart’s Track is essentially a tale of exploration in a new and mysterious land – a great Australian story.